These are the people closest to you, they’ve planned along side you for months now and you want to show your appreciation. My first suggestion is a hand written note. Add on a customized gift, and you’re set! 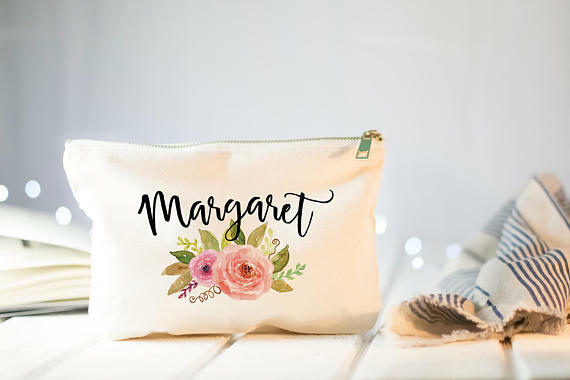 I personally love gifts that the wedding party can use on the wedding day, and then thereafter, such as robes, makeup bags, cute cups, mugs and wine glasses. Or perhaps, a pretty necklace is more your style? Either way, I’ve picked out some of my favorite gifts from Bridesmaidsgiftboutique.com! They graciously sent me my own customized gift so I could ensure that my brides would appreciate the experience of ordering and LOVE the product! LOVE getting makeup bags… can you ever really have too many? I use them to keep organized in my purse, of course for traveling, and even for more organized packing. Add in wedding colors and my initials and I’m sold! I picked this bag for my gift as I liked the simple gold script. Order your own here. When something already comes beautifully packaged, I’m all about it. Yes, you could go buy all of the components separately, but why not let someone else do the work? I love the “getting ready” photos of everyone wearing a matching robe, and having a wine glass with your name on it really just makes it easier to find your beverage when there are 10 other mimosas in the room! Click here to shop! One of the coolest ideas a bride has had for the morning of her wedding was hiring a personal yoga instructor to guide her wedding party through a slow, relaxing flow. They were able to start the day feeling refreshed! Get a personalized yoga mat for each of them - talk about unique! Buy them here. We haven’t forgotten about the guys! Check out their sister (or brother, I should say) company for all of the fun, personalized gifts your groomsmen could want! The caricature faces on mugs are my favorite! Figuring out what to wear to a wedding can be quite the task. But dressing to impress as your family or friends say "I do" doesn't have to be difficult. Check out this guide from The Black Tux for what you can wear to a wedding this summer and fall! Always be sure to read the invitation for any attire guidelines! 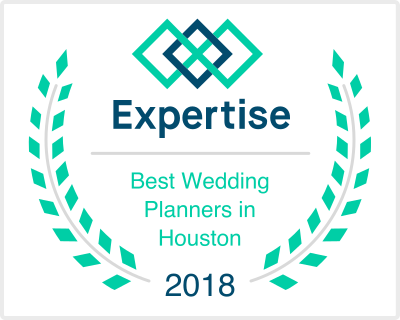 In continuation of our Houston Wedding Venue blog list, let's move on to Historic Venues in the Houston area! These venues boast such unique interiors, have a history that your guests will enjoy and simply beautiful. Whether you're looking to go industrial, museum like, or just appreciate the story behind the structure, be sure to add these to your tour list for this summer! 1. Inquire about pricing and capacity prior to your visit! You don't want to show up and fall in love with the place only to find out that it's out of your budget or can't accommodate your guest list. 2. Consider a rain plan for any outdoor activities for your wedding day- especially your ceremony! Do you like their Plan B for the ceremony or cocktail hour? What will rain do to the parking lot? 3. If there is a caterer included or required, inquire with them as well before touring. Get menu pricing per person or ask for a general quote for your guest count. This could easily make or break the decision to tour! Located in Montgomery, TX, this quaint venue has an indoor ceremony space, now with central heat and air conditioning, as well as a large reception space with built in bar and enough space for up to 300 guests. The bridal suite and groom's suite are on the smaller side, so depending on your wedding party count, you may consider doing hair and makeup offsite. Note: They require you to use their bar services, but there are many packages to choose from! Yes, at first glance this space is very industrial, but it's so unique! Add in a lighting package, some draping and you've transformed the space with beautiful windows and natural lighting into the perfect space. Also centrally located in Midtown, it's super convenient to some of the major churches in the area! Bonus, guests can tour the museum downstairs as they may their way to cocktail hour! Note: As I mentioned, I would budget for additional lighting and decor to soften the space and make it feel more "wedding like"
This place is SUCH a gem. Located just west of Katy in Brookshire, it has a real cotton gin located in the lobby. Guests will appreciate being able to mingle for drinks and dancing around this unique space. You can have an indoor or outdoor ceremony, and this location is also great for rehearsal dinners! Note: This venue is best for smaller guests counts if you'd like a seated dinner. Max Capacity is between 80-100. Not to be confused with Station 3, another historic fire station in the area! The Heights Fire Station is quaint and affordable. The bricked exterior is adorable, and the white interior gives you a blank slate for your wedding design! They also partner with two parks in the area which would be great ceremony sites. Note: You may prefer to rent different chairs to elevate the look of your wedding. Clear cut pricing is on the website too. You may be familiar with the hotel in downtown, but didn't know about their wedding reception spaces. Quaint decor, but recently upgraded rooms create the perfect wedding weekend getaway. They can host your ceremony and reception without sacrificing the look or experience for your guests. They also have unique smaller spaces for rehearsal dinners! Tip: I LOVE booking weddings at hotels- you get the ultimate expereince by having a full service, 24 hour staff. Hey #newlyengaged! We hear from couples all of the time about their struggle to find their perfect wedding venue. While this is a service we offer, we wanted to also highlight some of our favorite venues in each category. This post, we're focusing on those dreamy garden-style venues. Outdoor ceremony or cocktail options, natural lighting- love, love love! 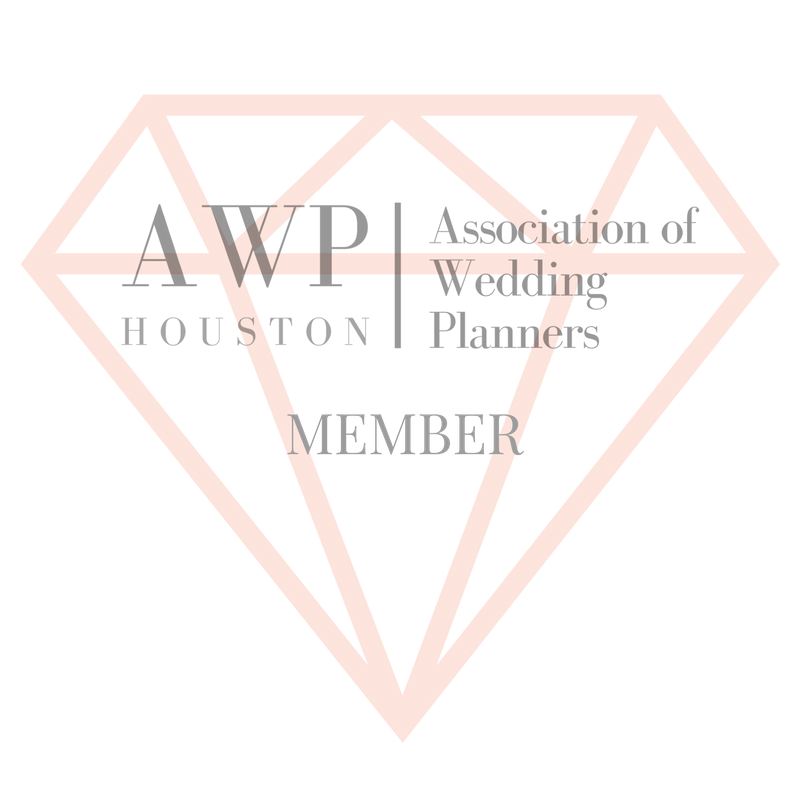 Also, check out our post about Houston's top Modern Event Venues too! Ya'll, this little gem is tucked away in the middle of River Oaks! You've probably driven by so many times, and didn't even notice! It boasts gorgeous gardens, a gazebo, indoor areas for food or dinner. Perfect for hosting your reception, or smaller ceremonies + receptions. I encourage stations for food service to really allow people to mingle through the space! Tip: You will need to bring in all of your own tables and chairs! Not only just a restaurant, you can choose from the different sized rooms with floor to ceiling windows for your reception! The upstairs patio feels like you're floating in the trees, and it's such a convenient location being directly downtown. Have your guests stay right across the street at either the Marriott Marquis or Hilton of the Americas. Tip: You can even host rehearsal dinners here! Nestled right into Buffalo Bayou is the venue "in the trees!" The Dunlavy is both ultra luxe, boasts a fantastic menu, has top notch service and is stunning! Everything about this venue tells your guests that they're in for a fun night! Note that the guest count is limited to 100, and it's a little more comfortable to host your ceremony offsite, but they have the patio as your ceremony option! Tip: Be sure to hire professionals for floral and decor as you have very limited time for set up! Looking for a garden style venue in the heart of the Museum District? McGovern Centennial Gardens is for you! You can rent the Celebration Garden for your ceremony and move inside to their reception space for dancing. Or, flip the Garden for your dinner and dancing. This is also a great place to take your bridal or engagement portraits! Just be sure to ask your photographer to get permission. Tip: They have a required Caterer list, so be sure to factor their pricing into your overall budget! Houston's wedding industry is booming, and there are more options than ever on where and how to get married. 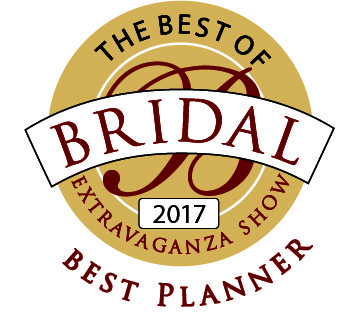 Small, intimate weddings, off-beat, unique weddings, or your traditional ballroom affair, you're covered! In today's post, I want to focus on Houston's Modern Wedding and Event Venues. These are typically described as a room or building with clean lines, neutral or white color schemes, unique, modern architecture and boast open, well thought out spaces. Note: You will need to rent all of your tables and chairs! Note: There is also a back up Indoor Ceremony space if weather isn't on your side! This hotel makes the list as it's interiors are modern in colors, with funky chandeliers and open pre-function space. 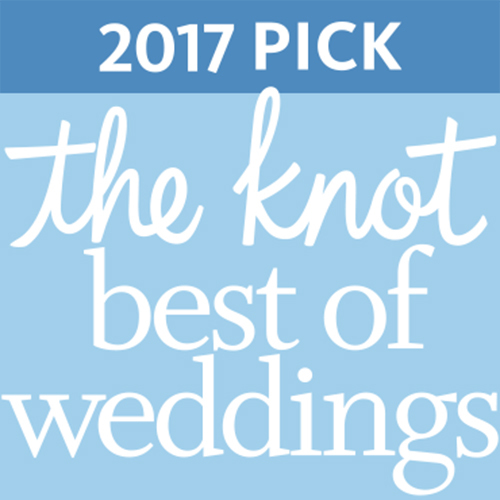 They have unique options to host many events for your wedding day weekend, as well as large parties of 500! Centrally located and with a beautiful lobby, even if you don't host your wedding here, the room blocks are convenient! Note: Their Lobby Bar and Breakfast areas rock! Note: You will need to bring in all tables and chairs- any lighting will be crucial to setting the tone! I've had some couples ask me recently about the etiquette surrounding wedding gifts, so I thought I'd make a quick post addressing just that! This is a quick guide for both couples and their guests on approaching the subject of wedding gifts and registries. Many couples are opting for honeymoon funds, or trying to navigate how to ask for cash to buy a home. While these are practical and more modern ways of having a wedding registry, we still recommend to have a traditional registry available to guests who would prefer to buy you a gift. So head on down to Bed, bath and Beyond and start scanning! If you would like a honeymoon/home buying fund, I'd suggest an online site where you can write a little story about why you're opting for this as a way to receive gifts. Personalize it! TIP: Never list the registry or gift request on an invitation! It should be listed on your website, or told to guests via word of mouth/ by family and wedding party who host showers. Bridal showers are traditionally hosted by the bridesmaids, although parents and siblings may also want to host. If you have more than one bridal shower (or a couples shower) it can seem like a lot to ask of guests to attend more than one. Only close family and wedding party are typically invited to every shower, so try to keep the guest list different for each one (for example, a work one, or one for guests from a specific state, like your college crew). When it comes to gifts, showers are a great opportunity to buy the couple a wedding gift before the wedding. If you're invited to a shower, it is proper to bring a gift, unless otherwise specified. Recently, a couple of mine opted to ask for recipes at a couples shower, since many of the guests were also invited to the Bridal shower. It is a popular misconception that guests are able to send a wedding gift up to a year after a wedding, so be sure to send it before the wedding date. Couples, be sure to keep a list of the gifts you received and from whom, as to reference it for thank you notes, or if you happen to host them at your house for dinner- it would mean a lot if you were able to show off the china you received from your Aunt over Christmas! Hope this helps! If you'd like to chat more about Wedding Etiquette, shoot us an email! Pop the champagne- it is Engagement season! If you're like me, you've seen so many of your friends or family members get engaged this holiday season- and it's not over! So bookmark this article and share it with the lovely brides-to-be as soon as they've settled down from celebrating! Yes, we've seen and retired the burlap and lace-wrapped mason jars, but that doesn't mean we still don't love those gorgeous, historic barns, or the sweet, vintage details! So, we're revamping the rustic-chic by adding a touch of glam and whimsy. Indulge in luscious blooms, surrounded by sparking mirror-top tables, mixed metal stem and flat ware and large focal points; such as a boxwood lined lounge area or glimmering chandeliers. This doesn't mean skimping on the details. It's changing your focus to what is already beautiful; a garden venue with fresh flowers, or a modern space with tons of lighting features. Minimalist design appreciates negative space and incorporates an industrial feel, such as using acrylic accents, or monochromatic color schemes. Say, what?! Kale- it's the Pantone color of 2017! Let's embrace those neutral hues, such as eggshell, dusty blue, kale green and champagne tones. Liven it up with tons of candle light, greenery and wooden chargers or farm tables. Using edible glitter of course! Add these sweet edibles to your cake table or use them as guest favors. They are sure to delight and add a touch of whimsy. Nom! Mismatched flatware, stemware, chargers and napkins- all within the same color scheme. Varied textures, table runners, overlays and chair adornments. Lighting, draping and chandeliers and hanging florals. YAS! Did I mention how important lighting was? If you'd like to indulge in any of the these 2017 Wedding Trends with me- let me know! 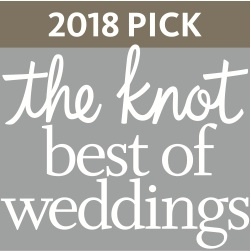 And, while we're at it, we can plan the unique touch to add to YOUR wedding! Your ceremony isn't until 5, yes, hair and makeup can take five hours with all your girls, your mom, his mom, etc. But what about before that? You and I both know you're not getting much sleep, (although I do recommend it! ), so let's be proactive and talk about some ideas of how to fill the morning hours on the day of your wedding! Morning, yoga; a little ohm, stretching and very slow sequences to get you centered and calm- sounds like a dream right? There are Yoga Instructors that will come to you! Have them meet at your hotel suite, or possibly in your backyard the morning of your wedding. Invite your girls, get some blankets and yoga mats and RELAX! Kind of typical, but for a good reason! I don't recommend any sort of facial, waxing, tanning etc. but perhaps some time in the steam room, a little foot massage- it'll do wonders! Plus, you can walk around in a robe and slippers and sip on Cucumber water. I'd like to do that every day if I could! If you're like me, you want to be outside as much as often, weather permitting of course. So, invite your girls or your mom and sisters to have breakfast on the patio. If it's too hot (I mean, we ARE in Houston) pick a restaurant with a lot of natural light. That Vitamin D works wonders on elevating your mood! Indulge in an egg white omelet, fresh fruit and a mimosa (or two). What ever you decide, allow yourself to feel pampered and not rushed. This day is a special one, so take a deep breath and take it all in!